but this time with different post. 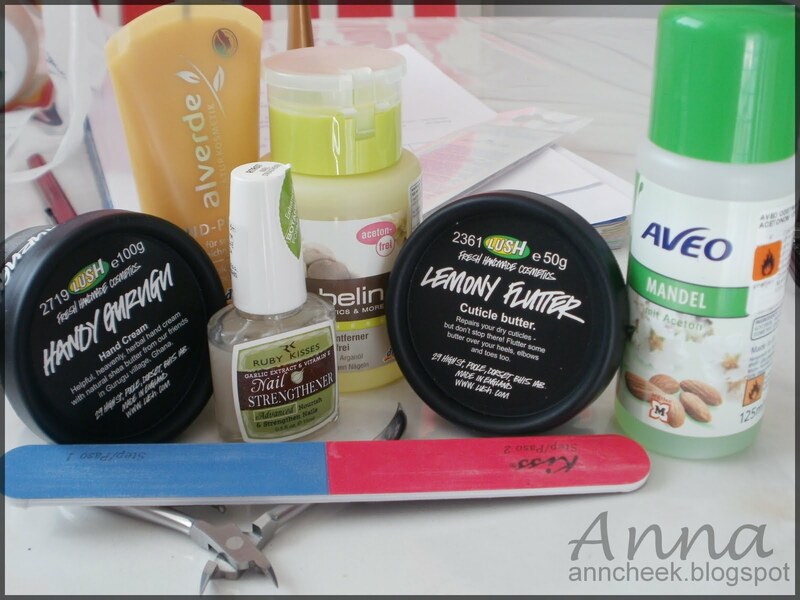 Its about my hand and nails care products that i love! And i use them daily! 1. Lemony flutter, cuticle butter. Love, love this one! I use it daily! Love the smell, and love how my cuticle looks healthy and moisture all the time. 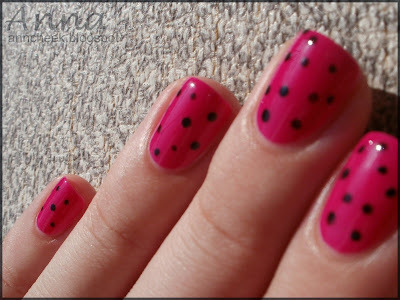 Even if i work for 6h, and i wash a dishes a LOT, my cuticle looks good! I try a lot of different products and i always come back to this one! 2. Handy gurugu hand cream from Lush. This is my second favourite hand cream, my first one is from L'occitane, but i used it only at winter, because is too expensive! This one is good too and a little bit chiper;) Its herbal cream and it smells funny, but i like it. contains Shea butter, and thats a big+. 5. Ruby kisses nail strengtener with garlic extract & vitamin E. My nails are in a better shape;). Like it! I always love manis with dots, but i never try it on my nails. Well i like it! 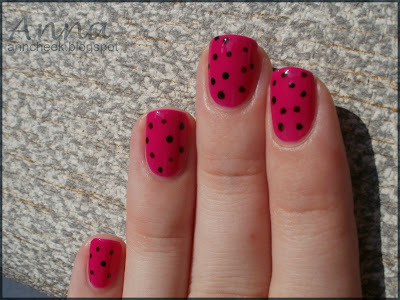 pink and black dots, nice combo! Let me know about your favourite nail and hand care products, i love to read that kind of posts! Jaz iščem en dober utrjevalec za nohte, tako da bom verjetno preizkusila kar tega od Ruby Kisses. Tole limonino Lushevo kremo moram pa res kupiti, same pohvale berem :) Lepa manikura!